Another day, another raw food recipe. 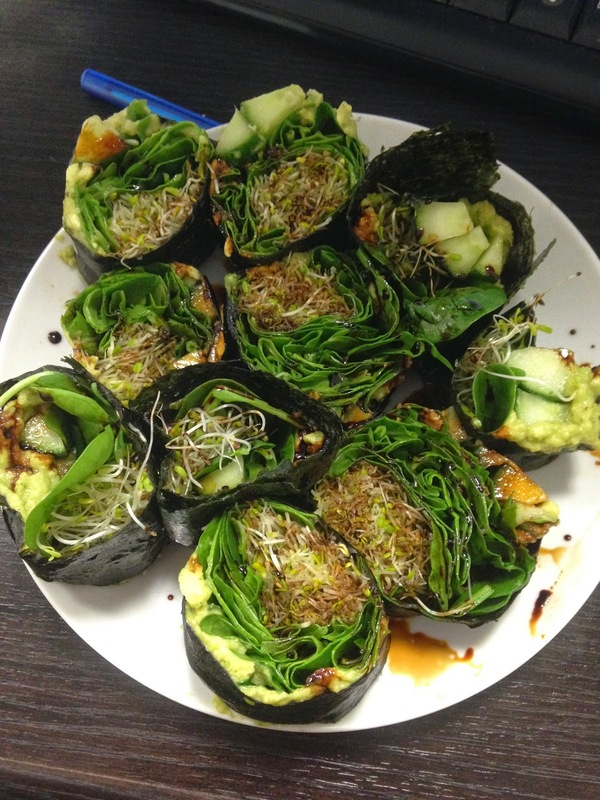 This one is Raw Vegan Sushi. Its something that I made up on the spot as today I was running late for work, I didn't grab anything for lunch and I didn't feel like fast 'food'. So off I went to the shops to see what I could invent. These rolls were the result. - spread avocado evenly over two nori sheets. - place sliced cucumber, alfalfa sprouts, rocket and spinach on top of avocado mash. - roll up sushi sheets. Hold until they keep their shape. - Use a wet sharp knife to cut into bit sized slices. - sprinkle a little tamari sauce over. I'll probably be eating these for lunch everyday this week now that I have all the ingredients at work. They were so yum and easy to make.